Wading through the world of anime can be a daunting task and every now and then, one will stand out from the crowd and Blade of the Phantom Master done just that, in this action orientated mind F**K that left me reeling for more. 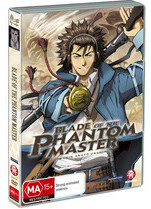 Unlike traditional Japanese anime stories, Blade of the Phantom Master is taken from Korean folklore and revolves around a loan survivor of the Jushin Empire, more specifically a peace keeper who has the powers of the Phantom Masters. The story begins in the desert where Munso, the protagonist of the film is saved by a young man who wishes to become a Phantom Master or more specifically, an Amen Osa, a protector who also has the ability to summon dead warriors. Unfortunately his life is cut short by the Desert Devils and Munso now discovers why this young man wanted to become an Amen Osa as his land is oozing with darkness and corruption. Munso soon discovers the town of his deceased saviour Monlyon and he decides to disguise himself as the young man to learn what is going on. Munso learns that this mans lover was Chun Hyang who is being used as a powerful weapon by the lord of this town. Munso inspires a rebellion against the lord which backfires when Chun Hyang is unleashed as a deadly female warrior to quash the rebellion. Even with his twin guns and undead warriors, Munso has a challenging fight, however when Chun Hyang discovers that her lover is dead, she becomes lost and seeks a new purpose and solace with our hero. Like the gruff hero, he turns her away, however when Chun Hyang, now transformed into Sando saves his life, he reluctantly allows her to join. Together they investigate the mystery on the island that truly throws a few psychological twists into the work which I cannot spoil here because the discovery is quite huge. The animation is fantastic on DVD and the fight scenes are extremely well choreographed through the animation with a few CGI effects thrown in for good measures to make this a very impressive production. Add in some great voice acting, an engaging musical score and a plethora of fun and over the top special effects and this is a well made anime film that had me drawn in from the first few moments of the story. Unfortunately just when you’re getting right into it, the story ends and I would love to see more adventures of Munso. Just be warned that Blade of the Phantom Master is quite a gory movie with the most memorable scene in the film being Munso using the body of Monlyon as a shield against the Desert Devils. Blade of the Phantom is a pure indulgent experience that breaks away from the anime stereotypes, except for the cute black bat but none the less, I recommend it!